The Sydney-based Pearl and Dagger Company performs works that blend music with theatre. Set up in 2014 to present the C17th English masque Cupid and Death, the company focuses on English-language works from the Baroque, Classical and Romantic eras. The Pearl and Dagger Company present lesser known historical works that bring together our love of music and drama in intimate venues where concert-goers can interact with, and be immersed in our performance. Our aim is to draw our audience into a rich ambience reflecting the social and cultural context in which the work was conceived. We invite our audience to experience another period in time for the duration of the show. 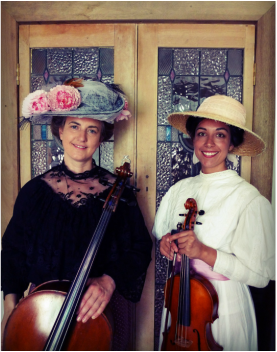 Artistic directors, Imogen and Tara, both specialise in historical instrumental performance and share a love of the best of times gone by. We collaborate with artists from different fields including actors, singers, historians, writers and directors. We spend time researching to create interesting, accessible and beautiful performances.